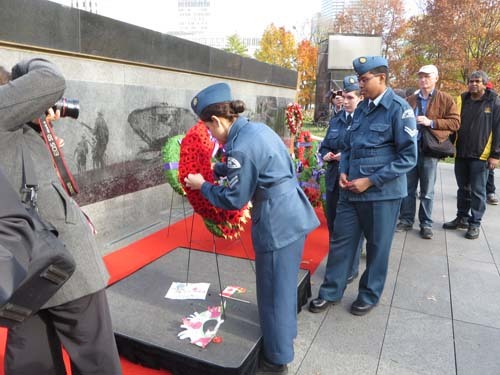 For City of Toronto commemorations on November 8 and 11, see: http://bit.ly/1x9eboT. The largest of these is at Old City Hall and is telecast live on CP24. The day is also commemorated at the provincial level at Queen’s Park. http://bit.ly/1isNLZC. Among other groups marking the occasion is the Nine Sparrows Arts Foundation & Yorkminster Park Baptist Church. Its “Concert of Remembrance” is at Yorkminster Park Baptist Church, 1585 Yonge St. two blocks north of St. Clair Ave. on November 7 at 7:30pm. Admission free; donations welcome. This church will also have a ceremony on November 11 at 10:55am. http://bit.ly/1KM62rA. The Ukrainians have their Remembrance Day on November 8. For our 2014 Blog on Remembrance Day at Queen’s Park, see: http://bit.ly/1REEBFr .